Where are the reports for my custom object with related objects in salesforce? Author posted by Jitendra on Posted on May 22, 2011 under category Categories Salesforce and tagged as Tags Salesforce with 4 Comments on Where are the reports for my custom object with related objects in salesforce? Very often it is observed that after creating the custom object which is related to other object, developers get surprise that where is the report option for my object with that custom object. When creating a custom object, you can use the “Relationships” section to define relationships between this new object and other objects. For example let’s say you have a new object called “Expense” that you want to attach to an “Account“. 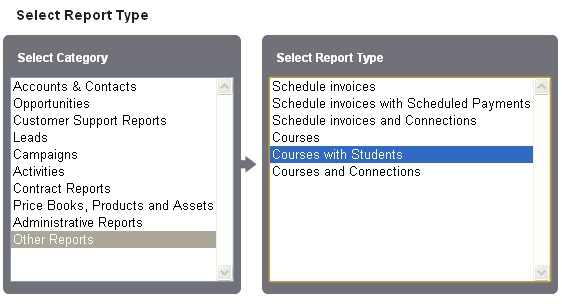 When you check the “enable reports” box and you go to the report wizard where you choose the type of data you want to report on, after the standard sections like “Accounts & Contacts”, “Opportunities”, “Administrative Reports” you’ll see a new section for “Other Reports”. When you choose that section you’ll see an “Expenses” report type only. Ensure that the relationship between accounts and expenses is a master-detail relationship. Look for the “Accounts with Expenses” report in the Accounts & Contacts section, not the “Other Reports” section because Account is the Parent object. Lets take the example of our previously created application of the “Student and Courses“, in which course is the parent object. As the parent object is not the standard object, in this case the report will be in the “Other reports” section as shown in below image. Hi hope, this article will help to find the cause and solution that where is the custom objects report in salesforce. You can start from below URL to make an application in salesforce end to end. You can use the help and training section of salesforce which is very usefull, i have also started from same. If you stucked in any problem then use the salesforce community, it is one of the most active community. Please dont hesitate to ask more questions, if you have. what abt the relationship is lookup between two custom objects? That will also appear here, However make sure that “Enable Reports” setting was checked while creating object.